The governor of Zimbabwe’s central bank said it will begin issuing its own version of the US dollar bill. The cash-strapped country will start using the bond notes in October, and expects $75 million to be in circulation by the end of the year. Zimbabwe is a multicurrency country since it stopped printing its own money, the Zimbabwe dollar, in 2009 due to hyperinflation. It uses the South African rand, the euro, and the Chinese yuan, alongside the US dollar. The central bank governor, John Mangudya, said the cash, known as bond notes, will be backed by $200 million support from the Africa Export-Import Bank. The specially-designed two, five 10 and 20 dollar notes will have the same values as their US dollars equivalents. Bank customers are not always able to withdraw the amount of US dollars they would like on account of a shortage of dollar notes. The country already has “bond” coins that represent US dollar values. For each coin in circulation there is an equivalent US dollar held in the country’s reserves. "The bond notes will be at par with the US dollar and will be used and treated in the same manner as bond coins," John Mangudya, the governor of the Reserve Bank of Zimbabwe told CNN money. The token currency has stoked fears for many residents that the move marks a return to a much-loathed local currency by stealth, and prompted protests. Residents have nightmarish memories of the last time the country had its own currency. 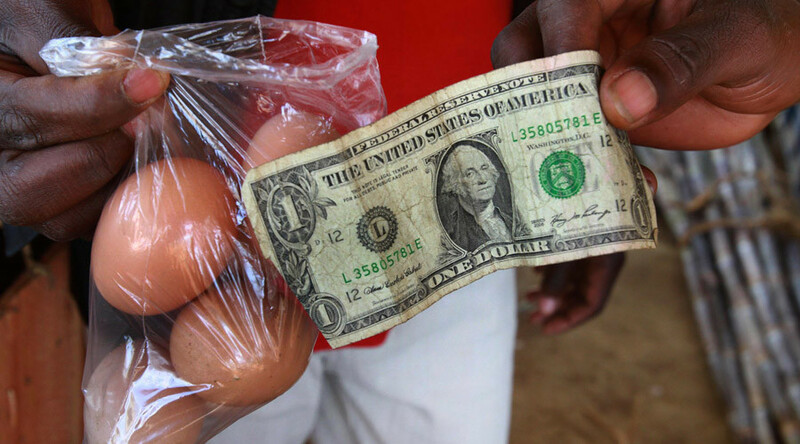 “[The] biggest denomination was a $100 trillion note that was not enough to buy a loaf of bread as hyperinflation reached 500 billion percent in December 2008,” according to Spotlight Zimbabwe. The country has run a trade deficit for several years, importing more than it exports, and left the country literally running out of paper money. The announcement comes after Zimbabwe said earlier this month that it plans to cut 25,000 government jobs. The country has been struggling to pay its workers as the country’s economy plummets. The government has not paid salaries on time for nearly 300,000 workers since June, according to Associated Press. Finance Minister Patrick Chinamasa told parliament that the country also plans to get rid of annual bonuses to save money. Chinamasa said salaries alone eat up 96 percent of the government's dwindling revenues.